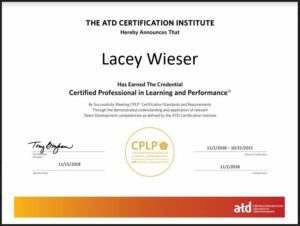 Phoenix, AZ – October 22, 2018 – Wieser Learning Solutions is pleased to announce that Lacey Wieser, CPLP has earned the Certified Professional in Learning and Performance® credential from ATD CI (the Association for Talent Development Certification Institute). Earning the CPLP certification means Lacey Wieser, CPLP possesses the knowledge and skills to be a top performer in the talent development field. Becoming a CPLP provides credibility by recognizing that an individual has an overall understanding of the ten Areas of Expertise for talent development as defined by the ATD Competency Model™, and can apply this knowledge in the workplace. To earn the CPLP certification, Lacey Wieser acquired industry-related experience, successfully passed a knowledge examination and skills application examination. The CPLP certification process is rigorous and challenging. It produces candidates with a breadth and depth of knowledge that brings significant benefit to their employers, colleagues, and clients. ATD is the world’s largest association dedicated to talent development professionals. ATD started in 1944 when the organization held its first annual conference. To support members’ ongoing development in the field, ATD formed the ATD Certification Institute (ATD CI) to take the lead in setting professional industry standards and certifying talent development professionals. More information about the CPLP program may be found at www.td.org/cplp.